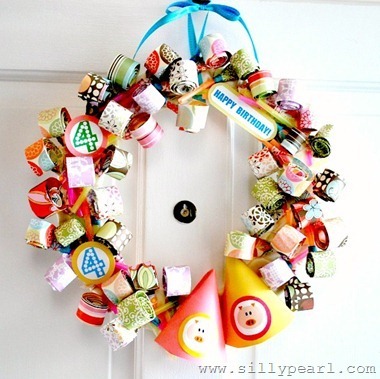 We are continuing birthday celebrations here at The Love Nerds with this adorable Party Blower Birthday Wreath from The Silly Pearl. How cute is this?! When it comes to birthdays, I can easily come up with delicious recipes to make, but I struggle with decorating ideas. I always plan on decorating for our birthday week – my husband and I were born only five days apart – but I can never think of cute ideas. In comes Steph from The Silly Pearl to save the day!! This birthday wreath is ADORABLE! Seriously, one of the cutest things I have ever seen. What is really awesome is that Steph also shares a tutorial for how to make homemade party blowers! She searched for cute ones to purchase, but she came up empty and got crafty. I am definitely keeping this tutorial close. It’s so hard to find party supplies that match a theme and decor, but now I can make custom party blowers to match any party.